The Ventura Chapter is participating in the Ventura Strong Rebuilds Green Expo on June 16th to discuss how Surfrider’s Ocean Friendly Gardens criteria can be applied in Fire Hazard Zones to protect both local water resources and community safety. The following article was written by Mara Dias, the Surfrider Foundation’s national Water Quality Manager, and is cross-posted from https://www.surfrider.org/coastal-blog/entry/applying-ocean-friendly-gardens-criteria-in-fire-hazard-zones. With some forethought and good maintenance, our gardens and yards can be Beautiful, Ocean Friendly, and Fire Resistant (Word Doc) – protecting the safety of our families, our community and our water resources. Last year, the U. S. experienced one of the most devastating wildfire seasons on record. Unfortunately, with warmer and drier-than-normal conditions being predicted again many western states will be at high risk for significant wildfires in 2018 as well. While Surfrider members in all three western states of Washington, Oregon, and California became all too familiar with their altered viewscape of smoke burning in the distance and impaired air quality reports, nowhere did our Surfrider community suffer more from wildfires last year than in Sonoma, Santa Barbara, and Ventura Counties in California. Many of our members were forced to leave their homes with their neighbors to protect the safety and health of their families. In the wake of the Thomas Fire – the largest fire in California history- not only were communities in Ventura and Santa Barbara Counties left to deal with sifting through the ashes and rebuilding, but heavy rains in January 2018 caused massive flooding and mudslides that brought even more devastation to life and property. The impacts of wildfires on flooding and water quality can be felt for years after the flames are put out. The root systems of trees and other burnt vegetation are weakened and unable to hold water and soil during rain events. Adding to this, is the fact that burnt landscapes also develop an impermeable, waxlike layer in the soil after it cools creating conditions that trigger massive runoff and mudslides. Learn more about how wildfires exacerbate flooding here. Continue reading at the Surfrider Foundation Coastal Blog! And check out our chapter Ocean Friendly Gardens page for videos, checklists, and other resources, like this native plant list! 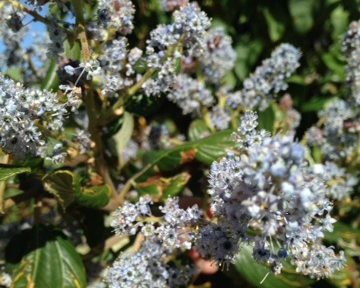 Many native plants, including Ceanothus species such as wild lilac, are both fire-resistant and beautiful!